A seafood meal sits on a pedestal for most Egyptians. It’s not just a meal; it’s a whole festival of flavours, a strategic plan of which dishes to combine in what portions, and a celebration of your insights and decision-making ability. This is why it is tough to find a restaurant that serves really delicious seafood, but it seems Blue El Mrakby is one of those special restaurants. Located in Sheikh Zayed’s The Courtyard, Blue El Mrakby is a beautiful blue and white restaurant that gives you relaxing coastal vibes. The Courtyard only has four restaurants, but it’s still quite a lively place. Blue El Mrakby is a three-storey restaurant with an outdoor area on the ground floor which is surrounded with curtains to help against the cold weather. We were delighted by the colours and decoration, as well as the friendly and professional service of the staff. They even gave us colouring books to keep the kids busy while the food was prepared. Their menu is quite diverse; from soups to tajines, different rice options, and a host of sandwiches, drinks, and salads. In addition, of course, to their fish fridge where you can pick your feast for the day. They have your usual soups and tajines, but we were especially intrigued by the Orzo with Seafood and Freekeh with Shrimps tajines. The surprising thing is that they also serve fried liver and brains. After a long time in deliberation, we agreed on a diverse feast comprised of the following: Mullet Fish (100 EGP per kilo) cooked with oil and lemon, Power Seafood Tajine (85 EGP) which had shrimp, squid, fish fillet, and cream, along with bell peppers and onions, topped with mozzarella cheese. We added to that a dish of Sayadaia Rice (18 EGP), Baladi Salad (20 EGP), Baba Ghanoug (20 EGP), and Pickled Eggplant (15 EGP). They first served up the salads and bread (which came fresh and toasted), and added a complementary Molokhia with Shrimp (40 EGP), which was quite a nice gesture. After 30 minutes, just as they promised, the rest of our feast was set, and it smelled wonderful. Starting with the mullet, it was expertly cooked, dry as we requested, and perfectly seasoned. The rice is a crucial ingredient in a seafood meal because it ties all the dishes together, and theirs was one of the best we’ve tasted, it looked exceptional, and it seemed that they knew what they were doing. As for the complementary Molokhia with Shrimp, it was a bit small, a bit salty, but overall quite tasty. But now let’s move on to the star of the meal, the tajine. It was a huge portion that would easily satisfy two hungry adults, generously laden with seafood delicacies, and perfectly cooked. Perhaps we would have preferred the cream to have a more firm texture; it needed to be a bit thicker to hold all the ingredients together. Nonetheless, it was an excellent dish. The salads were also delicious, giving us a break between each bite to enjoy something different. After our feast, we opted for the traditional drink after a seafood meal, Lemon Juice (25 EGP). It was refreshing, not too sugary, and not too clumpy. We were so happy with the meal that we opted for some takeaway sandwiches. Overall, the experience was delightful; from the food to the service, and the atmosphere of the restaurant itself. We’ll certainly keep this on our list for seafood restaurants in Cairo. If you visit them during January, you can enjoy a 15% discount on their meals for dine-in, takeaway, and delivery. 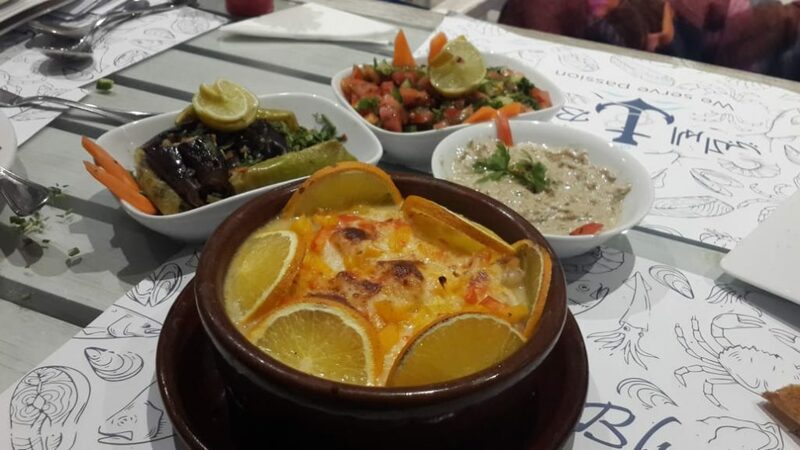 Blue El Mrakby also serves up special seafood dishes with creative sauces. Expertly cooked food, reasonable prices, and excellent service. The texture of the cream in the tajine needed to be thicker.